Where there’s creativity you will find Tanille Edwards! The triple threat has written and released hit Pop and R&B singles, penned children and teen novels, and continues to be a positive role model for young people. Tanille Edwards is using her talents to change the world. “If you have touched just one person in a positive way the experience was well worth it,” she said. “If you can touch many, it is a blessing to have the gift to do so. Amazing Kids! recently got the chance to talk with Tanille about her music, her writing, and how you too can chase after your dreams! Keep reading to learn more about this amazing mentor. Amazing Kids! : How long have you been singing? Tanille Edwards: I have been singing since I was a little girl. I would do performances for guests that would come over the house. Then around age 7 I started singing in the choir at my grandmother’s church. From there I did a youth group choir in my early teens. It was a few years later I started song writing. AK! : What inspired you to go into Pop and R&B? TE: I always really liked Pop music and R&B music. I think when I look at my early music inspirations like Aretha Franklin and Elle Fitzgerald and Whitney Houston there is such a rhythm and blues inspiration. When I write, my songs tend to express themselves in Pop and R&B keys and rhythmic structures. AK! : What do you hope listeners experience or take away from your songs? TE: I hope they feel connected to the moments of love and life described by the lyrics. I hope they feel inspired to move. I hope they remember moments in their life when the emotions expressed in my songs rang true. I hope they feel the energy of the performance as part of the experience. AK! : What was your favorite song to write and record? TE: I think at this point a song I recently worked on, “One Wish,” may be my favorite yet. I like to look back at how the love developed. When I wrote it I wanted to express the willingness to try love again and go back to something that once was so poignant and palpable. AK! : How are your singing and writing careers connected? TE: I think there are similarities in the inspirations that lead to writing novels and songs. The process of writing a novel is very different than that of a song. I start writing a song with a feeling. Then it moves to a story I want to get off my chest. It can be a moment in time or the essence of something I feel that can be conveyed emotionally through words. Song writing at times can be poetic. Then at other times is can be very scenic like a page from a story. I try to connect my songwriting and my chapter work by creating chapters that have themes that are involved with a song I have written. If 4 or 5 songs are included with the book 2 or 3 make actually make their way into the storyline through inspiration or by actually having the song mentioned or played in reference to a moment in the story timeline it relates to. Once we take the lyrical aspect out of it the development of the song becomes very different than the development of a novel. You then get into the keys, the harmonic sounds, the tempo, the feel, and the production that resonates with the truth of the song. When I develop a novel. I have to have an idea of where the story ends to understand where it is going throughout. I also need to understand what I am trying to communicate to readers. From there I try to sew in real life moments to the storyline and assign human characteristics to bring my characters alive. AK! : What inspired your novel Broken? TE: I started “Broken” with a thought. I wanted to describe a love that would challenge one to figure out the boundaries between themselves and what they would do for love. I do not relate to all my main characters. I have probably met or been friends with people who have similarities to most of them. I do find some of myself in these characters. Tanille’s novel comes with free music downloads of some of her music! AK! : What is the most rewarding part of empowering young women through your songs and books? TE: I believe touring and reading reviews where readers say. “I want to be this character in high school,” or, “I have been through some of the things Milan faced,” are the most rewarding. It touches my heart to know my stories inspire confidence, comfort with ones self and self expression. If you have touched just one person in a positive way the experience was well worth it. If you can touch many, it is a blessing to have the gift to do so. And I feel almost a responsibility to main a level of optimism and respect within my work to live up to the potential to inspire in impactful ways. AK! : Did you have any mentors or role models who helped you break into these industries? TE: I have had people help me along the way and introduce me to others who also tried to get my work in front of the right people. I would have to say though overall many of my big breaks came through cold contacts who genuinely had interest in my work. Of course this route is ripe with challenges of constantly figuring out where to send your work. And you get a heck of a lot of rejections. But through those rejections your work gets better and you get tougher. AK! 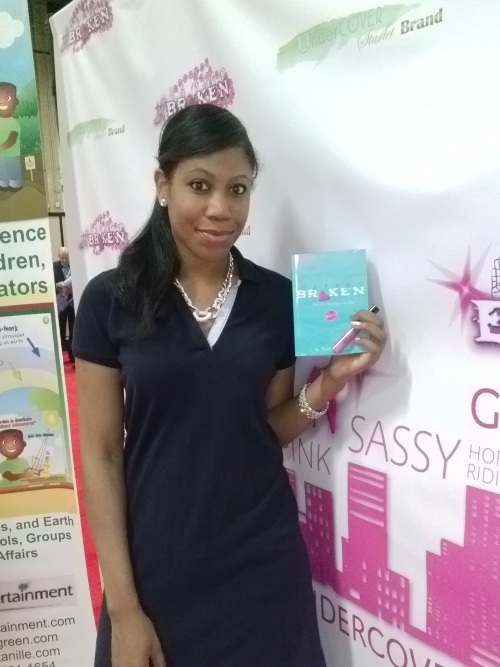 : What advice do you have to our young readers who are also chasing after their dreams? TE: Never ever give up no matter what anyone says. You are valuable, and what you bring forth into this world is valuable. Try and if your first attempt doesn’t work, try again and again and again until you succeed. Your faith in your own dream will attract those who can help you succeed. 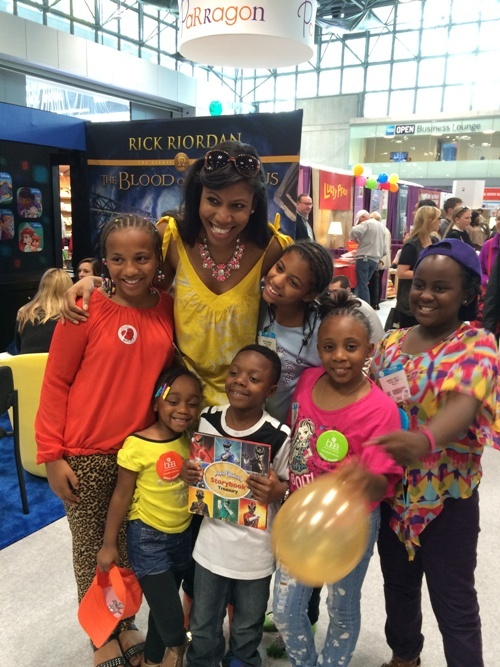 Tanille with fans at Book Expo America. AK! : Do you have any new exciting projects in the works? 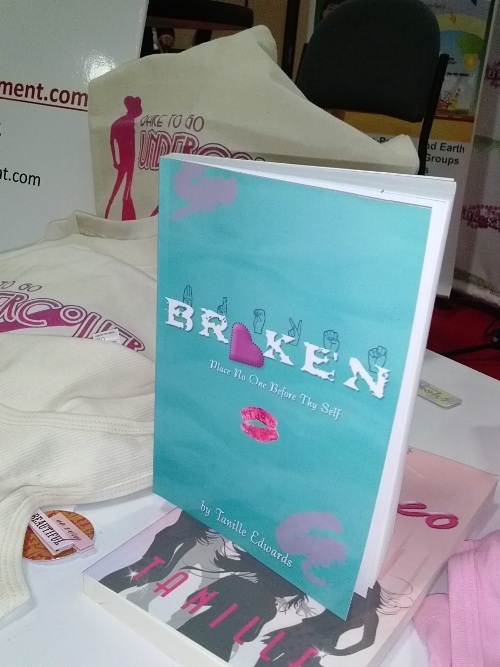 TE: I am currently working on the “Broken” sequel. I am also working on several new types of songs. I have a few Christmas songs I wrote and will record in January. I am working on some new songs for the soundtrack “Broken 2.” I am looking forward to my spring school tour.